Cloth diapering today is not what it used to be. When many parents think of cloth diapers they think of flat diapers that need to be folded and fastened with diaper pins and then covered with plastic pull on covers. 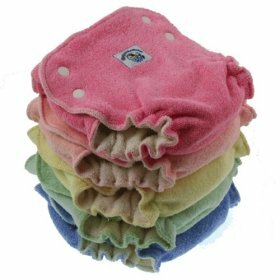 Generally they also think that the clean-up involved with using cloth diapers would be tedious and messy. It seems as though many parents have missed the total evolution of the cloth diaper that has occurred over the past decade or so. New choices in materials and high tech fabrics are causing an increasing number of parents to reconsider whether disposable diapers are the best choice. 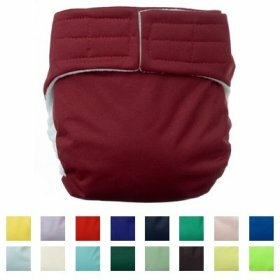 We have options now that provide us with cloth diapers that are elasticized so that they are fitted and snug, waterproof in many instances, breathable, and manageable with velcro-like closures or snaps. They are just as easy and as convenient to use as disposables. Of course, it is not just their functionality and convenience that has been affected by this evolution either. Cloth diapers available today are absolutely adorable, available in a variety gorgeous colors, prints, and luxurious textures and fabric. That is a big selling point for many parents because there is nothing cute about a disposable diaper. Quite simply, cloth diapers are convenient, cost effective, healthier for our children, and better for the environment. I feel as though the real question parents should be asking themselves is why use disposables? As a general rule, it is almost always cheaper to reuse than to buy new every time. This is no different with cloth diapers. Most parents go through 6 to 8 thousand diapers per child, from birth to about age three. If we take an average of what those diapers cost, that equates to between 2000 and 3000 dollars per baby. Once those children are potty trained those diapers are gone. They can’t be re-used. So a significant chunk of our heard earned money has gone to buying, what is essentially, garbage. In comparison, enough cloth diapers to last for three years will usually cost between 3 to 8 hundred dollars. At minimum that is about a 1200 dollar savings. But wait, consider too, that those cloth diapers may last for one or more successive children and your savings doubles and even triples. Of course it is difficult to make any hard and fast statements in this regard because of the varying costs of diapers, electricity, water, and detergents. Yes, cloth diapers will usually mean an extra one to three loads of laundry a week, but if everyone were to weigh the extra costs of their electricity, water usage, and detergent, I think they would be pleasantly surprised. These costs are infinitesimal compared to the cost of expensive disposable diapers. What should be of serious concern to all parents are the toxic chemicals present in disposable diapers. Dioxin, which in various forms has been shown to cause cancer, birth defects, liver damage, and skin diseases, genetic damage, is a by-product of the paper-bleaching process used in manufacturing disposable diapers, and trace quantities may exist in the diapers themselves. 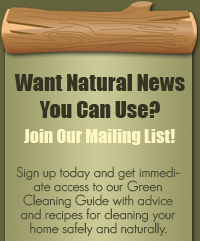 Dioxin is listed by the EPA as the most toxic of cancer related chemicals. Disposable diapers contain Tributyl-tin (TBT) - a toxic pollutant known to cause hormonal problems in humans and animals. Disposable diapers also contain sodium polyacrylate. If you have ever seen the gel-like, super absorbant crystals in a disposable than you have seen this first hand. Sodium polyacrylate is the same substance that was removed from tampons because of its link to toxic shock syndrome. 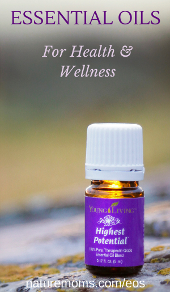 No studies have been done on the long-term effects of this chemical being in contact with a baby's reproductive organs 24 hours a day for upwards of two years. Studies have also been done to show that the chemical emissions from disposable diapers can cause respiratory problems in children. Cloth diapers, on the other hand, are free of the many chemicals contained in disposable diapers. According to the Sustainability Institute eighty percent of the diaperings in this nation are done with disposables. That comes to 18 BILLION diapers a year, just in the US. They require thousands of tons of plastic and hundreds of thousands of trees to manufacture. After a few hours of active service these materials are trucked away, primarily to landfills, where they sit, neatly wrapped packages of excrement, entombed or mummified, undegraded for several hundred years. The idea of a "disposable" diaper is a myth, the ramifications of which will stay with us for centuries to come. They are the 3rd largest single product in the waste stream behind newspapers and beverage containers. The urine and feces in disposable diapers enter landfills untreated, possibly contaminating the ground water supply. When you consider the unnecessary depletion of our valuable forests, the huge volume of garbage created, the toxic air and water pollution and the potential health risks to children, it is very difficult to comprehend how washing and reusing cloth diapers could ever be considered an inconvenience. They are a rewarding investment all around. A financial investment, an investment in our children’s health, and an investment in our planet. The options available today prove that cloth diapering doesn't have to be inconvenient. Cloth diapers nowadays are fitted with elastic in the legs and back area, they have easy hook and loop closures or snaps too. Many different fabric choices and absorbency levels allow parents to choose the best diapering system for their own individual needs. It just can't get any easier. There is no time like the present to make a firm commitment to your child, to your pocket book, and to your planet and start using cloth diapers today! #1 Rated Diaper Happy Heiny's Pocket Diaper with Free Insert. Daddy and baby-sitter approved. 20 colors to choose from. 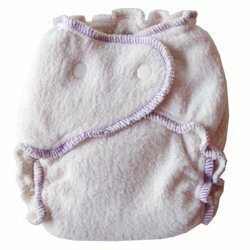 Kissaluvs Fitted Cloth Diaper! The best diaper for newborns.